BitMEX (short for Bitcoin Mercantile Exchange) is one of the most popular Bitcoin futures exchanges for advanced traders and speculators. It’s also known as a derivative market for crypto instruments which allows for trading leveraged positions with Bitcoin (XBT). It’s important to note that leveraged trading is both highly risky and rewarding. Thus it should be treated with caution, especially at BitMEX, where margins can run up to 100x times. BitMEX began its operation in 2014 and is based in Hong Kong. Security is a top priority at BitMEX, and the exchange hasn’t experienced any hacks yet. Besides, it offers the lowest Bitcoin margin trading fees and has a frictionless sign-up process including only a few steps. The platform has a clear UI and easy-to-use dashboard, but it might pose a steep learning curve for beginners. If you’re just entering the cryptocurrencies space, you might be better off starting with a simple exchange. Our recommended reputable fiat-to-crypto exchanges include Bitstamp, Coinbase, and Poloniex. Futures Contracts. The agreements to buy or sell cryptocurrencies at a predetermined price on a specific date in the future. Perpetual Contracts. Agreements which are like futures contracts, except they do not have a predetermined expiry date, so you can hold them as long as you like, or until your position is liquidated. BitMEX UP & DOWN Contracts. These are option contracts that let traders participate in the potential upside or downside of an underlying asset. Users can speculate on Bitcoin price at a particular settlement date, and receive or pay the difference for guessing right or wrong. UP and DOWN Contracts cannot be shorted, and they expire early if the price touches or falls below predetermined KO barrier price. It helps users to limit potential downside. Up to 100x leverage on certain contracts denominated entirely in Bitcoin. Above-average customer support. Unlike most businesses in the space, BitMEX offers several 24/7 customer support channels. In addition to a support ticketing system and comprehensive knowledge base, the help desk can be reached via Weibo, Wechat, IRC, Twitter, and Reddit. A typical query takes BitMEX around an hour to respond. Professional and secure exchange. BitMEX interface is fully customizable and tailored for professional traders. The platform is highly secure and deploys multisignature cold storage, two-factor authentication, PGP email encryption, and full risk checks on every user trade. Comprehensive order types for different trading strategies. BitMEX users can place limit, market, stop market, stop limit, trailing stop, take profit, hidden, iceberg, post-only, and close-on-trigger orders. BitMEX Testnet. Margin trading typically involves high-levels of risk-taking, so beginners should know what they are doing before trading. If you’re willing to learn, you can try BitMEX Testnet. It’s a 1:1 copy of the mainnet (but with separate index) running on fake Bitcoins. It's a place to get familiar with the platform before signing up on the mainnet. BitMEX was founded in 2014 by HDR Global Trading Limited, which is led by former bankers Arthur Hayes, Samuel Reed, and Ben Delo. It is incorporated in the Republic of Seychelles and operates from Hong Kong. Since its launch, the exchange has become one of the best know Bitcoin derivatives exchanges. BitMEX is not a typical crypto-to-crypto or crypto-to-fiat exchange and is not meant for beginners. If you're not an experienced trader, you’ll have to step up your game and learn a lot about how to use it and what risks to take. First, you won’t trade cryptocurrencies, but their futures contracts and swaps. Second, the platform accepts Bitcoin only, so you won't be able to use fiat currencies nor altcoins. Also, be aware that BitMEX that residents of United States, Quebec (Canada), Cuba, Crimea and Sevastopol, Iran, Syria, North Korea, and Sudan are prohibited from using the exchange. Is BitMEX Easy To Use? 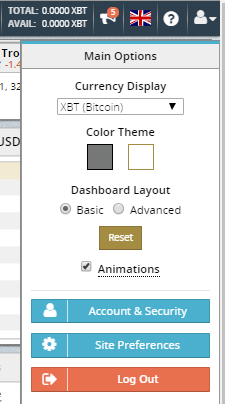 BitMEX has an intuitive and effectively designed dashboard which can be customized according to your preferences. It displays all the necessary options, including TradingView charts, order book, recent trades, and orders panel. It should be fine for a regular trader but might be a little overwhelming for a beginner. The widgets on the platform can be modified according to your viewing preferences. On the left side, you can select your preferred type of order, amount, and level of leverage. Once you determine the variables, the widget will automatically calculate the order price, liquidation price, and other relevant order information. Limit Order. An order that fills once the market achieves a selected price. Market Order. An order which executes immediately at a current market price. Stop Limit Order. A stop order which places a limit order when the market reaches a trigger price. Stop Market Order. A stop order which places a market order when the market reaches a trigger price. Trailing Stop Order. An order with a set trailing value; if the market reverts by it, a market order is placed. Take Profit Market Order. An order which executes when the market reaches a trigger price. Take Profit Limit Order. An order which sets a limit order on a trigger price. Hidden Order. A limit order not visible on the public order book. Iceberg Order. An order which consists of two parts - one visible on the public order book and one which isn’t. Post-Only Order. An order accepted only if it doesn’t execute immediately. Close-On-Trigger Order. A stop order which makes sure that an order closes open positions on trigger price and does not add new contracts in the opposite direction in case you had several orders. Speaking of the market price, it’s determined by buyers and sellers at the exchange. Also, BitMEX uses its market index, which reflects the combined average market price of Bistamp, Coinbase Pro, and Kraken exchanges. At the moment, BitMEX allows trading contracts for Bitcoin (BitMEX uses alternative BTC ticket XBT), Cardano (ADA), Bitcoin Cash (BCH), Ethereum (ETH), Litecoin (LTC), EOS (EOS) and Ripple (XRP). Leverage allows users to place orders that exceed users current account balance. It can potentially lead to higher profits from a trade, but simultaneously increases the risk of a position or account balance liquidation. BitMEX allows traders to leverage their positions with up to 100x leverage, but that applies to XBT trades only. Altcoin derivatives can be charged with up to 20x-50x leverage. In any case, BitMEX leverage substantially surpasses other margin trading exchanges, which typically offer up to 20x leverage at most. Inexperienced players should take their take to study and learn more about BitMEX leverage, but seasoned traders might find it clear and simple. If you’re a beginner who is determined to try the exchange, BitMEX Testnet a great place to start learning. Trading fees always affect your profits, especially if your strategy involves trading a large volume. Like most exchanges, BitMEX charges taker and maker fees, which activate whenever you make or take an order. Though BitMEX maker fees are negative, which mean that traders receive a rebate (0.025-0.05%) when their order is filled. Such incentive stimulates active making to prevent huge price discrepancies. BitMEX taker fees deviate from 0.075% (XBT) to 0.25% (altcoins). Also, there are futures settlement fees that vary from 0% to 0.05%, and funding fees that apply for perpetual contracts. 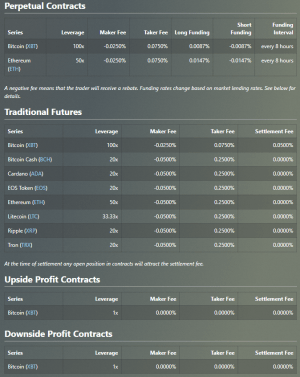 Here’s a complete table of fees that apply to BitMEX trading products. Besides the principal fees, there are extra fees for premium features like hidden or iceberg orders. A hidden order always draws the takers fee, while an iceberg order pays the taker fee until the hidden amount is filled, and then incurs the maker fee for the non-hidden quantity. Apart from that, BitMEX doesn’t charge fees on deposits and withdrawals, but there’s a dynamic Bitcoin Network fee which typically amounts to 0.001 XBT. Compared with other margin trading platforms like Bitfinex or eToro, BitMEX offers the highest leverage for the lowest price for small volume XBT traders. On the other hand, Bitfinex charges at least 0.05% less in taker fees when it comes to trading altcoin contracts. The same applies to other margin trading platforms like Poloniex and Kraken, which offer lower altcoin taker fees. However, BitMEX remains unique marketplace by offering negative maker fees and deserves the lowest-price margin trading platform title. Multi-signature cold wallet to store user funds. Amazon Web Services to protect the platform's servers. Manual checks of withdrawals from the platform by least two employees. Multiple forms of authentication to access individual layers of the platform. These include hardware tokens and monitored communication channels. BitMEX trading engine is written in kdb+, a language used by major banks for high-frequency trading applications. Full risk checks are placed on every deposit, trade, withdrawal, and settlement. If something goes awry, the entire system can be frozen. BitMEX has no reported hacking incidents in the past. Therefore, a consensus is that the exchange is highly secure and reliable. Bitcoin is the only cryptocurrency which can be deposited to the exchange. It is the fuel of the platform as it is used as collateral on trade and fees. The minimum amount you can store is 0.001 XBT. You don’t need to pass KYC before you can start using BitMEX services. BitMEX doesn’t charge users for both deposits and withdrawals, but there is a small 0.001 XBT network fee for withdrawals. 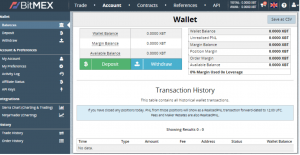 Due to the manual processing of withdrawals, they are sent out only once a day at around 13:00 UTC. A withdrawal procedure is as plain as it gets since you all need to enter is a withdrawal amount and your Bitcoin wallet address. How To Open An Account On BitMEX? Clicking it will open a new window with all the required registration fields. P.S. 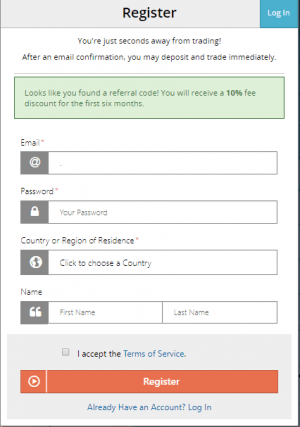 If you register via our referral link, you will get a 10% fee discount for the first six months! Once you fill your personal information and verify your email, you can log in to the platform and secure it with 2FA. Go directly to the upper left corner, click on the user silhouette icon and navigate to the “Account & Security” section. Once there, go to the security section, select your preferred two-factor type and follow the further instructions. When you’re done, you’re ready for your first deposit! You can do so by heading to the account section and selecting a green “Deposit” button. Once you deposit your funds, you can start trading. Before you do, it’s also useful to get familiar with the following terms in your account section. Wallet Balance. Your deposits minus withdrawals plus Realised PNL. Unrealized PNL. Profit and loss from all open positions at the moment. Margin Balance. Your total equity held in the exchange. Position Margin. The entry value of all your contracts divided by the selected leverage plus unrealized PNL. Order Margin. The part of your margin assigned to the margin requirements of your open orders. Available Balance. Your margin available for new positions. Again, be cautious, since cryptocurrencies are prone to extreme volatility, and margin trading is risky enough on its own! If you feel like you’re not ready, try BitMEX Testnet first. Enjoy!